The digital age has certainly arrived, as more and more people are enjoying digital media. But as the number of movies, MP3 files, and photos starts to mount, people are looking for places to store their ever-growing collections. 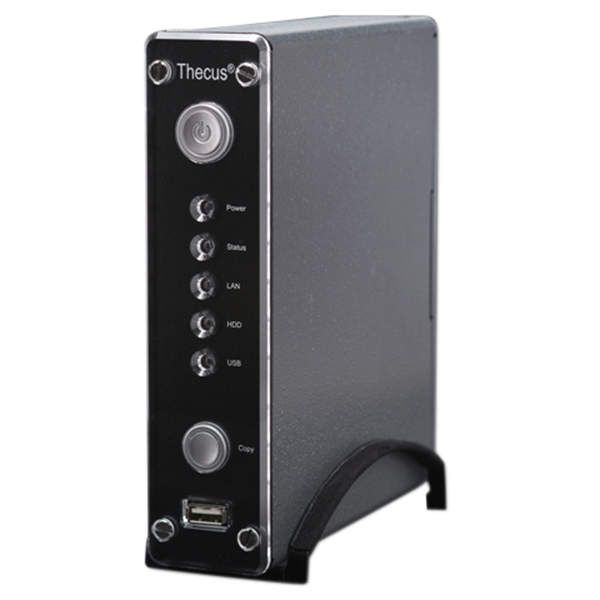 Thecus Technology, a recognized leader in digital storage solutions, is pleased to announce a digital storage device that is not only fully featured, but incredibly easy-to-own – the N199. Easy-to-use and very affordable, the N199 is the perfect entry point into the world of network attached storage. Enjoy digital entertainment the way it was meant to be enjoyed. The Thecus N199 can stream digital media anywhere on the network, allowing users to enjoy their digital media files throughout the entire house. Stream videos to a digital media adapter in the living room, or enjoy iTunes® music in the bedroom. The N199 makes it easy. Keep an close eye on everything with the N199's Simply Home Surveillance server. Just plug in a compatible IP cam, and the N199 can periodically take still pictures and upload them to a location of your choice – all without a PC! Why clog up the network when you need it most? The N199 comes with an advanced Download Manager that enables users to schedule downloads during off-peak hours. With support for BT, FTP, and HTTP downloads, the N199 downloads and stores files without the need for a full PC. The N199 comes with a convenient USB 2.0 port which allows users to plug in a USB storage device and backup the entire volume onto the N199 with a simple press of a button. What could be easier? When your network is ready to grow, the N199 has you covered. With its built-in eSATA port, users can easily add a third SATA hard disk to increase capacity or add RAID 1 protection. Don't let wires trip you up. The N199 can support wireless connections with the installation of a compatible USB wireless dongle. Users can enjoy complete wireless access to their favorite media files. Because technology doesn't have to be complicated, users can manage and access the N199 with any web browser. No special software. No hassles. The N199 is a great device to storing and sharing digital media. Users can install a standard 3.5" SATA hard disk into the N199 for up to 500GB of storage. With the hard disk installed, users can begin to store their digital media files, and begin sharing them throughout their networks with its Gigabit Ethernet connection. Users can even install a compatible USB wireless dongle for complete wireless access! When the need for more storage arises, the N199 can rise to the task with a built-in eSATA port. USB storage devices can easily be backed up with the N199 with its One-Touch USB Copy function. Simply plug in a USB storage device into the N199's speedy USB 2.0 port, press a button, and then all contents will be copied directly to the N199. It just doesn't get easier than this. But the N199 is also a great hub for the digital home. The included Media Server enables users to stream videos and more to compatible uPnP devices such as digital media receivers, allowing them to enjoy their digital media anywhere in the house. The iTunes® Server and Photo Web Server allow users to easily share music and photos respectively with PCs throughout their network. A convenient Download Manager allows users to schedule BT, HTTP, and FTP downloads during off-peak hours. And for true peace of mind, the N199 can even be used as a simple home surveillance server by plugging in a compatible IP webcam! All of this is administered through an easy-to-use web-based interface compatible with any browser in Windows, Mac OS, and Linux-based environments. "The N199 represents a breakthrough in functionality at this price point," says Thecus General Manager Florence Shih. "With the combination of useful features, ease-of-use, and attractive price, the N199 is a great way for people to discover how a NAS unit can enhance the digital lifestyle"